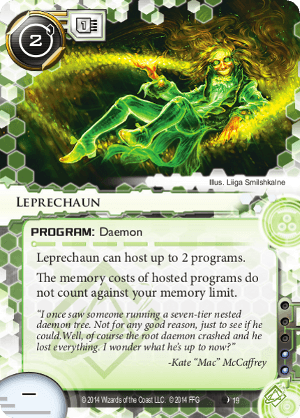 Leprechaun can host up to 2 programs. The memory costs of hosted programs do not count against your memory limit. This will be the card that brings magnum opus builds back. Cybersolutions mem chip was always just a little bit too expensive for opus builds to be fast enough for NBN. Leprechaun only costs 1 with kate, and even has extra potential upside, as it sometimes gives 3 MU if it's hosting an opus and SMC. With the first >2 MU programs coming out (Hyperdriver and Endless Hunger), this looks even better for builds that want to utilize them, especially alongside other chunky programs like Magnum Opus and SMC. Just be wary of program trashing, since a nested rig is much more vulnerable. question; what is the interaction inbetween leprechaun and adept/sage/savant? i want to say that these breakers use leprechaun for mu but since there is mu on leprehcaun they would not feed off of your mu?